Trees or rarely shrubs, evergreen or deciduous, monoecious. Branchlets often dimorphic: long branchlets with clearly spirally arranged, sometimes scalelike leaves; short branchlets often reduced to slow growing lateral spurs bearing dense clusters of leaves at apex. Leaves solitary or in bundles of (1 or)2-5(-8) when basally subtended by a leaf sheath; leaf blade linear or needlelike, not decurrent. Cones unisexual. 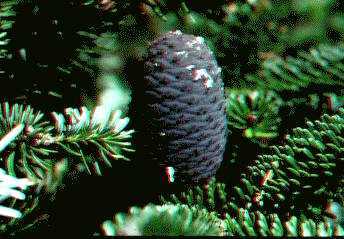 Pollen cones solitary or clustered, with numerous spirally arranged microsporophylls; microsporophyll with 2 microsporangia; pollen usually 2-saccate (nonsaccate in Cedrus, Larix, Pseudotsuga, and most species of Tsuga). Seed cones erect or pendulous, maturing in 1st, 2nd, or occasionally 3rd year, dehiscent or occasionally indehiscent, with many spirally arranged ovulate scales and bracts; ovulate scales usually smaller than bracts at pollination, with 2 upright ovules adaxially, free or only basally adnate with bracts, maturing into seed scales. Seed scales appressed, woody or leathery, variable in shape and size, with 2 seeds adaxially, persistent or deciduous after cone maturity. Bracts free or adnate basally with seed scales, well developed or rudimentary, exserted or included. Seeds terminally winged (except in some species of Pinus). Cotyledons 2-18. Germination hypogeal or epigeal. 2n = 24* (almost always). Ten or eleven genera and ca. 235 species: N hemisphere; ten genera (two endemic) and 108 species (43 endemic, 24 introduced) in China. Species of the Pinaceae are among the most valuable and commercially important plants in the world. Most species are trees, and are often excellent sources of lumber, wood products, and resins; many are cultivated for afforestation and as ornamentals. Cheng Wan-chün, Fu Li-kuo, Law Yu-wu, Fu Shu-hsia, Wang Wen-tsai, Chu Cheng-de, Chao Chi-son & Chen Chia-jui. 1978. Pinaceae. In: Cheng Wan-chün & Fu Li-kuo, eds., Fl. Reipubl. Popularis Sin. 7: 32-281.